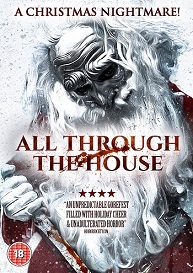 All Through The House is released on DVD November 21st And to celebrate we have a great competition for you and 3 copies on DVD to give away. Fifteen years ago, a peaceful Christmas neighborhood was engulfed by fear when five-year-old Jamie Garrett was mysteriously taken from her bedroom never to be seen again. Now on Christmas break, Rachel Kimmel comes home from college to find her neighborhood struck again by a reign of terror.